I had heard of Will Rock but never actually played it until now. I found a copy on eBay for pretty cheap so I bought it. Developed by Saber Interactive and published by Ubisoft, Will Rock was released for PC in June, 2003. To get it running on Windows 10, I installed the v1.2 Patch and ran the game using the executable provided by WSGF which allows it to run in a proper widescreen resolution. 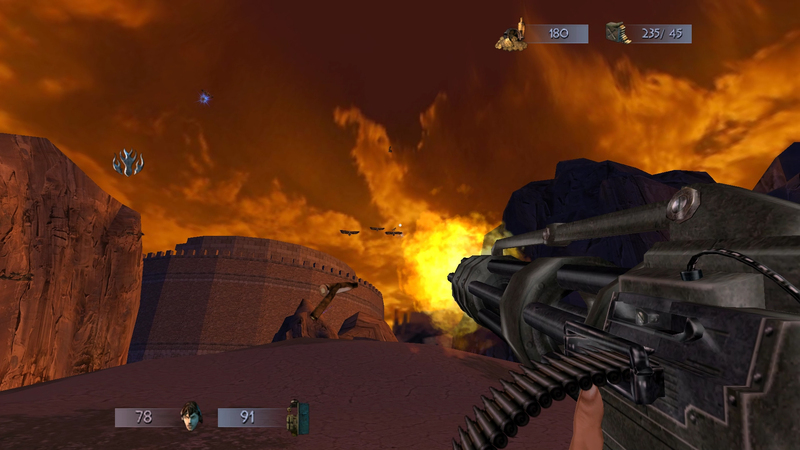 Before playing this I was under the impression it was a Serious Sam clone or at least poor man’s Serious Sam. You play as the protagonist named Willford Rockwell, otherwise known as Will Rock, an archaeology student. His girlfriend, Emma, is abducted by mythological creatures from ancient Greece. Will is recruited or possessed by the titan Prometheus and sets out to defeat Zeus and rescue his girlfriend. That’s really the gist of it. There’s two major cut scenes which are just a series of images accompanied by narration. One in the beginning of the game and one at the end. The one in the beginning provides some backstory and sets everything up so you at know what’s going on. Will is actually voiced and he speaks during the cut scenes and will spout one-liners here and there during gameplay. The performance isn’t fantastic but neither is the story. Will Rock plays like any other classic first-person shooter. Will can walk, run, jump, crouch, and swim. You start with a shovel and a pistol and acquire other weapons on your journey. If you take damage, you lose health and/or armor but you can acquire health and armor in the levels. You’ll pull chains and levers, utilize catapults, and you’ll jump on trampoline things or whatever they are to reach higher elevations and travel long distances. You can break objects and blow up barrels and you will want to acquire gold and treasure, both of which add to your overall currency. The currency can be spent at Titan Trading Altars on temporary powerups. These include immortality, titan damage, and titan motion. After you buy one you can activate it at any time. You can activate each of them once before you need to buy them again and they only last for a limited time. Immortality makes you invincible. Titan Damage makes your attacks more powerful. And Titan Motion slows down time and I found it to be pretty useless. That’s because you slow down as well. It would have been better if you could move and shoot at normal speed but instead, everything is slowed down. The manual states that Titan Motion is best used when you’re surrounded by enemies but I did not find it helpful. The arsenal is one of the better aspects of Will Rock mainly because most of the weapons look cool and feel satisfying to use. Your shovel is a melee weapon and I found myself using it here and there in the beginning of the game but the pistol is a far better fallback weapon, even at close range, since it comes with infinite ammo. You’ll eventually get your hands on a shotgun, machine gun, a mini gun, and a sniper crossbow which will set enemies on fire. The rest of the arsenal is actually quite interesting. The acid gun fires acid that will cause enemies to swell up and explode. The fireball thrower is like a rocket launcher. 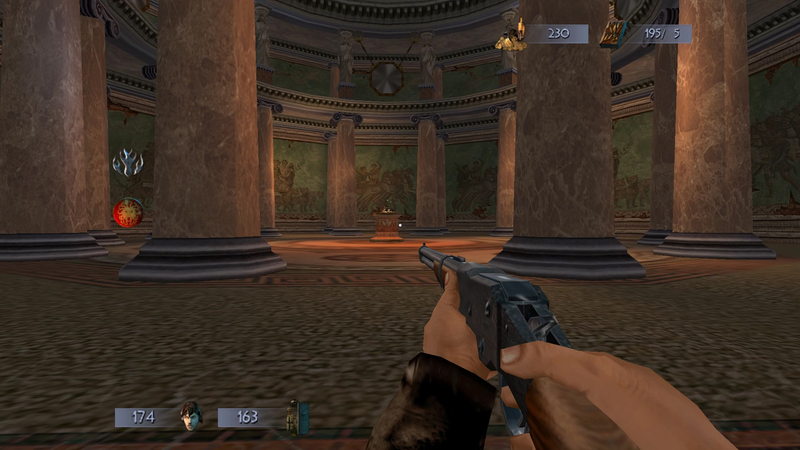 The medusa gun will turn enemies to stone. Grenades will explode if they hit enemies but if they land on the ground they act as proximity mines. Finally, there’s the atomic gun that fires a small nuke that can melt enemies in the blast radius. Ammo is lying around everywhere so it was rare that I ever ran out of ammo for any particular weapon. 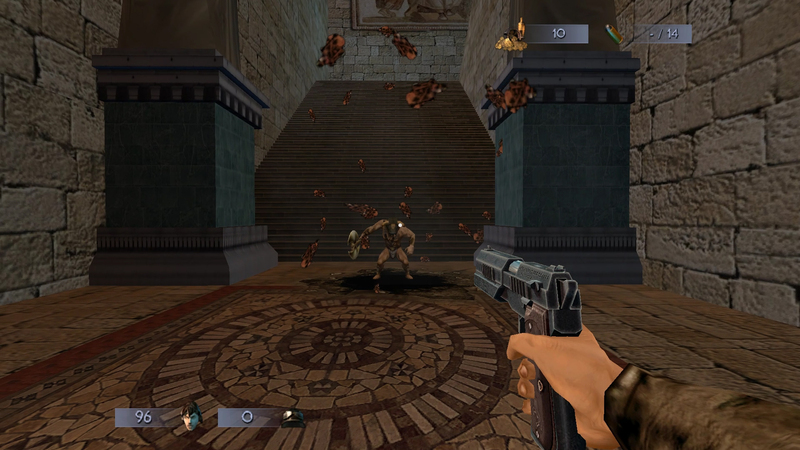 The game plays out in missions, with multiple levels per mission, and multiple sub-levels per level. You can replay any already completed levels from the main menu. There’s three difficulty modes – Will Win, Will Play, and Will Die. I played on the “Will Play” difficulty and found the experience to be rather easy. And that’s because almost every enemy in the game can go down in three shots or less. The bigger enemies can withstand a lot of damage but they don’t appear often. Despite the rather interesting and diverse roster of enemies, a lot of them feel the same and I never felt like I had to use specific weapons in specific situations. You’re going to get overwhelmed a lot and some weapons are better for that kind of scenario but they never feel necessary to survive. You can probably get through many scenarios with just the pistol if you really wanted to. I didn’t try playing on the “Will Die” difficulty so maybe that ramps things up significantly. You may want to start on that difficulty if you’re looking for a challenge. I will say, the enemies do make cool entrances. They’ll come bursting out of the ground and sometimes walls. You’ll get to engage Minotaurs, some of which can regenerate, Centaurs, Skeletaurs, Harpies, Satyrs, Skeletons, giant statues, lions, tigers, crocodiles, cerebrus, cupids, and rat-bombs which are rats that explode. They can actually be quite annoying. All of these enemies can be dispatched easily but they do come in large numbers. And that’s where the Serious Sam comparison comes in. 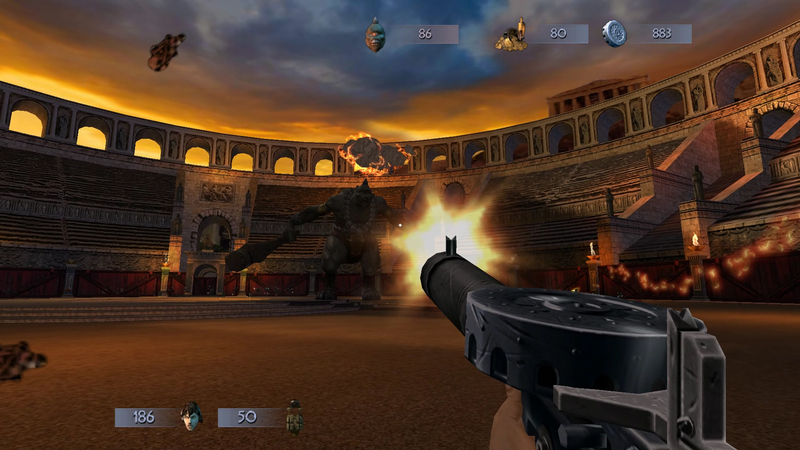 However, unlike Serious Sam, there’s not much challenge here nor do you have to deal with as many enemies as the Serious Sam games throw at you. The final few levels and/or sub-levels are probably the most difficult areas in the game but I think that’s due to the level design rather than the enemy encounters. Some enemies will rush you but most utilize ranged attacks and it’s when you’re getting assaulted by projectiles coming from everywhere that you’ll have to really be alert. The enemies do usually come in waves and if you know where they’re spawning from, you can easily stand near the spawn point and just pummel location with gunfire to take them out as they spawn. But if they’re coming from all over, you’ll want to run, circle strafe, and keep your finger on the fire key until they’re all dead. Towards the middle of the campaign, I seemed to always have more than enough gold to buy powerups and after a while, I felt that using them on enemies was just a waste. I saved them for the bosses which are easily the most challenging encounters in the game. The first two bosses really aren’t that hard and they will appear as regular enemies later on but the final two bosses, Medusa and Zeus, are the most difficult. You’ll battle your way through palaces, temples, ancient cities, rivers, dungeons, and other diverse locations. The variety of locations is pretty cool, actually, and I’m a sucker for Greek mythology so I really enjoyed the atmosphere. The level-design is pretty standard. You’ll be traversing through a lot of wide-open areas, there are secrets peppered throughout that usually house gold, and I did get lost in one area but most of the time it’s not hard to figure out where to go. There are some environmental puzzles but they’re pretty straightforward and you will have to watch out for environmental hazards like lava, spikes, and crushers. Visually, Will Rock definitely looks like a game that was released in the early 2000’s. As diverse as the locations are, they do appear rather bland and the animations are a bit stiff. I do enjoy some of the effects like the smoke and debris that kicks up when you destroy objects. 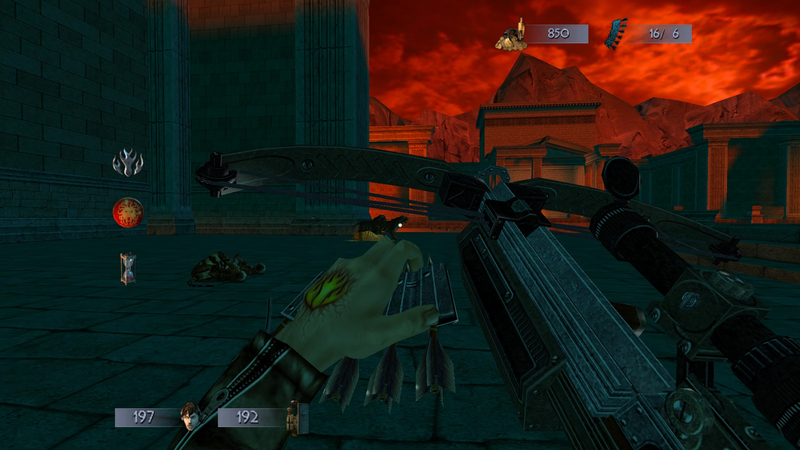 Harpies will leave behind feathers when killed, sometimes blood will appear on your arm and weapon, and the weapon models themselves do look pretty cool in my opinion. On the audio side, the weapons do sound generic but I’ve heard worse. Enemies will groan when killed and Cupids will let out a infantile cry but there’s really nothing that stands out in terms of the sound effects. The music has to be one of the more disappointing aspects of the game. The main menu is accompanied by “I Wanna Rock” by Twisted Sister so I was really hoping to hear a kickass rockin’ soundtrack. But, no, it’s average at best. There are a few rock tunes here and there, there’s some ambient and tense sounding stuff, but no awesome riffs or anything like that. I feel kind of deceived. I mean the name “Will Rock”, the Twisted Sister track, even the cover art gives the impression of a rockin’ experience. The music isn’t terrible but it’s not great either. Many of the songs are actually pretty catchy. On the technical side, I experienced no major issues. The frame rate did stutter here and there but I had a primarily smooth experience from beginning to end. I’ll be honest, I had fun with Will Rock but I’m glad I didn’t spend a lot of money on it. It seems like a forgotten title and I can see why. It does have some good qualities, however, most of what’s on offer here has been done before and much better. I would say the the one thing that makes Will Rock stand out is the Greek mythology stuff. The weapons are fun to play around with but there’s not much praise I can give the game. It’s average. It’s an average first-person shooter. It’s not terrible, it’s not incredible, it’s right in the middle. It does kind of feel like a budget title and as some have put it, “a poor man’s Serious Sam”. 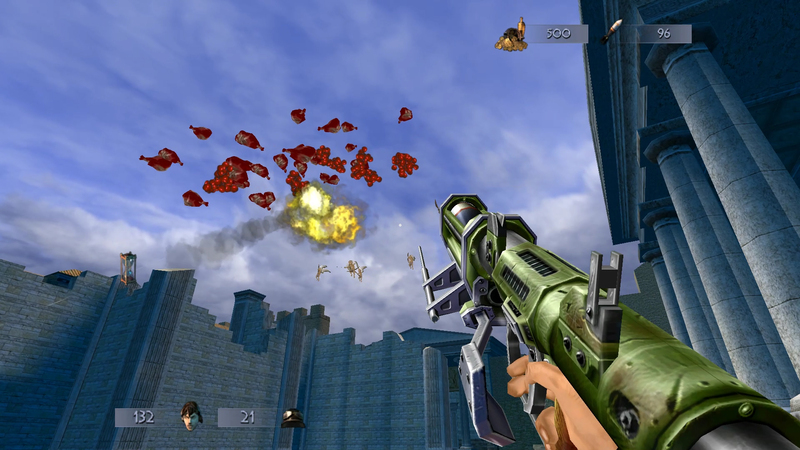 I would only recommend Will Rock to fans of shooters and only if you can find it for cheap. It’s decent, not great. There are better shooters out there but Will Rock does have its good points. The arsenal is cool and if you’re into Greek mythology, you may enjoy the setting and atmosphere quite a bit. If you think this looks interesting, check it out, but I would suggest you go in with low expectations.